The small white frame building located on the grounds of the Riley County Historical Museum, 2309 Claflin, is one of the ten to fourteen prefabricated houses brought on the steamboat Hartford to Manhattan, Kansas Territory in the spring of 1855. 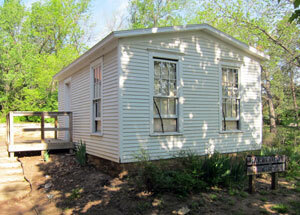 The Hartford House is open the same hours as the Riley County Historical Museum subject to staff availability. The Hartford steamboat left Cincinnati, Ohio April 26, 1855. Its passengers planned to steam up the Kansas River to the junction with the Smokey Hill River (where Junction City is today) and start a town named Manhattan. After a difficult trip the steamboat ran aground June 1 close to the confluence of the Blue and Kansas Rivers, near the newly established town of Boston. The Boston settlers invited the Hartford passengers to join their town, and as part of the agreement that was reached, the name of the town was changed to Manhattan. The Hartford's cargo, including the houses, was unloaded and the boat headed downstream. It ran aground again near St. Marys and in October 1855 was destroyed by fire. The large steamboat bell was salvaged by the Manhattan Methodist Church (which had been founded on board the boat) and now hangs in the Riley County Historical Museum. The Hartford House was originally constructed at 523 Colorado Street. In 1971 it was donated to the Riley County Historical Society by Mr. and Mrs. John Meisner. The Rotary Club and Tau Kappa Epsilon fraternity assisted with its move and restoration.